Thick handmade high carbon steel blade. Full tang battle ready sword (Not a "display replica"). Hand honed blade edge comes very sharp. Full tang blade extends to the end of the handle. 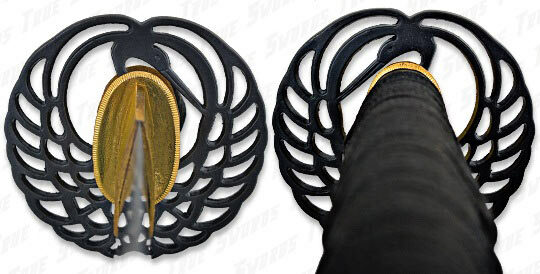 Unique guard (tsuba) and fittings. All fittings are tight and black finished metal. 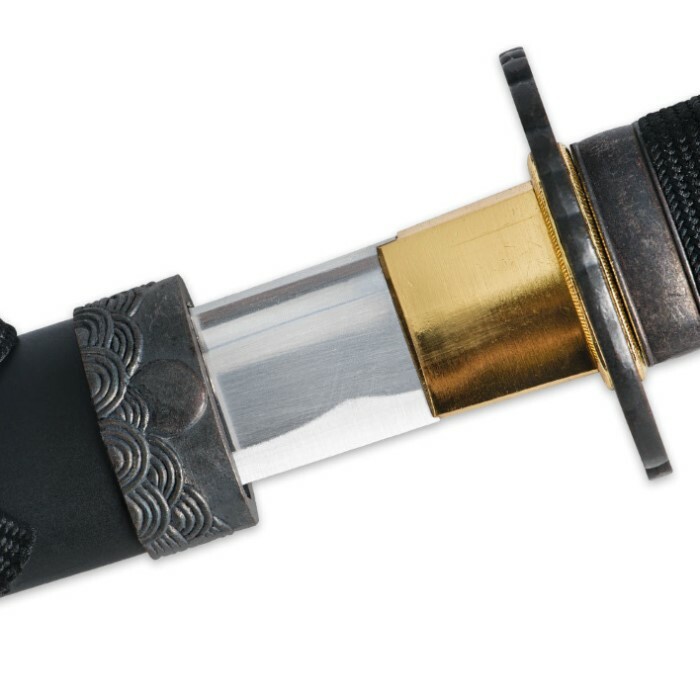 Black matte scabbard (saya) with metal mouth and engraved design. Black cotton cord wrapped hardwood handle. Includes black cotton sword carry and storage bag. This sword can be dismantled for care or display. Handle Length: 10 3/4 in. Overall Length: 38 1/2 in. Make no mistake,This is no wall piece and I would put my life on the line with this sword to prove it's battle ready. Just built so solid.My hat is off to the person who put this beauty together. I bought this sword on 04/09/2016 and it is very nice. The sword is sturdy and very sharp. It did not come razor sharp but a little sharping can do that. For the $39.99 This is a very high quality sword made by Musha. I am very happy I bought this sword and i will buy from Budk again. 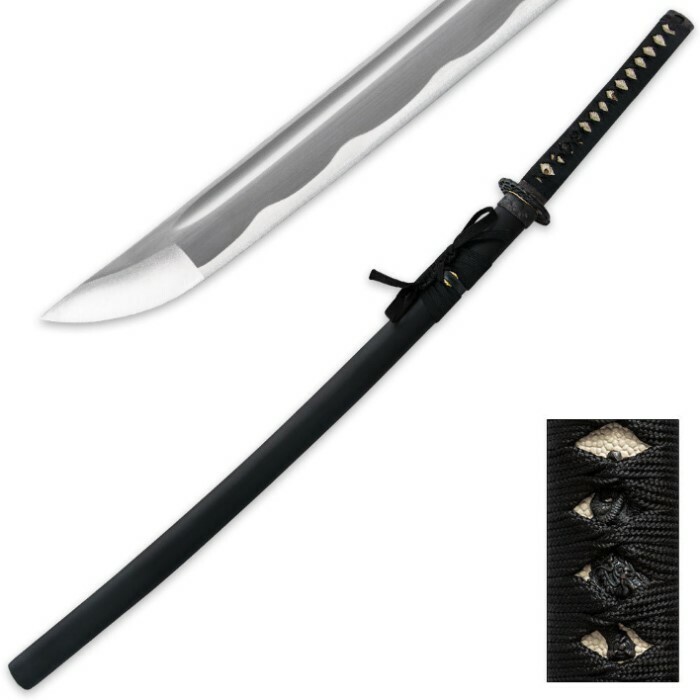 This Katana is well built, lightweight, sturdy and sharp out of the box. I was suprised that i was in awe once again by the Musha/Mushashi brand and i have come to belive that they are now my favorite. I also have th Raging waters Katana from Musha plus this Crane nd i have a few other Musha/Mushashi products. FIVE STARS. I gave this to a friend for his birthday without opening it and regretted it. There appears to be glue on the sword itself and making it difficult to remove(seriously). I think the glue came from the handle and just leaked to the sword making it a mess cause it got on the sword. All I want to say is for $40, you are getting your moneys worth my friend. It cuts well and I still have no dents or nicks in it and I have cut threw a few half inch branches to see what it would do to the blade. Well it is still straight and still cutting strong. 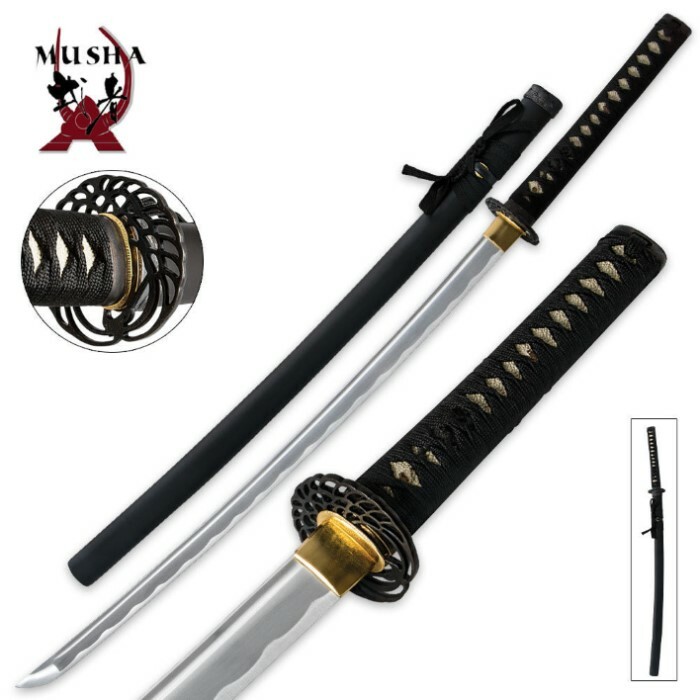 Awesome sword it looks great and it is a great price for such high quality katana.